How about dinner and drinks at an ice restaurant and bar? Or dinner in complete darkness served by a completely blind wait staff? Montréal, as one of North America’s best food cities (some say the very best) has everything, including the above. Montrealers are perhaps some of the most sophisticated diners on this side of the Atlantic. Poutine, a messy combination of french fries, cheese curds and gravy, is probably the first thing to come to mind when one mentions Canadian food. You should have no trouble finding it. But restaurants such as Au Pied de Cochon, which has a whole section of the menu devoted to foie gras and serves dishes such as pigs head and tongue, show that the clientele have a rather adventurous palate. 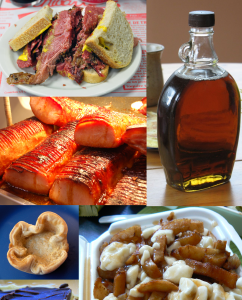 Foods that are typical of Québec would include smoked meats, French Canadian pea soup, oreilles de crisses (deep fried smoked pork jowls), tourtière (a type of meat pie), and sugar pie. If you happen to be around in March/April, a sugar shack meal is in order. Eggs, ham, beans, bacon, oreilles de crisse might be included in an array of Quebec foods, all of which should be doused with the maple syrup from the pot on each table.